The Billy Carter Gas Station Museum is dedicated to the youngest brother of President Jimmy Carter. Billy was known to be a beer drinking embarrassment to the Carter White House at times. While his “big brother” Jimmy was president you could find Billy hanging out at his gas station with a beer in hand. He would sit there and make statements about Jimmy, and the oil polices of the government. If something else would come to mind he would comment on that also. Today it is considered a “unique cultural landmark and a celebrated community gathering place”. The station is a small building just feet away from the highway. The two gas pumps are set to the 1979 gas prices. Billy’s service station was popular with the reporters that would stop frequently. 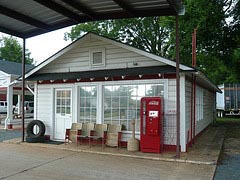 The gas station was better known for its indoor bar with a cooler stocked with beer and its backyard barbeques of ribs and catfish than it was for supplying any fuel. At the museum you can view “Carter’s Closet” where you will see some of Billy’s unique wardrobe such as a denim business suit and a pair of custom bib overalls made in red and yellow and a “wizard’s hat” made of beer can pop tops . Billy’s last pair of cowboy boots are there still caked in mud along with his “Plains Pounder” boxing robe. You will find empty “Billy Beer” cans string about also. It is said that the gas station sold 2,000 case of beer and 45,000 gallons of gas a month while Jimmy was in the White House. Billy was known as a heavy drinker for years. He died at the age of 52 in 1999 of pancreatic cancer, in Plains, GA.
You can visit this unique federally designated landmark Monday thru Friday from 8:30 AM to 5PM. Check the hours for weekends. The nearest larger city is Americus, Georgia, where you'll find a selection of hotels and other fun attractions to view. Last updated by jack on 31 January, 2012 in Destinations.